THE STORY - The battle for NINJAGO City calls to action young Master Builder Lloyd, aka the Green Ninja, along with his friends, also secret ninja warriors. Led by Master Wu (Jackie Chan), as wise-cracking as he is wise, they must defeat the evil warlord Garmadon (Justin Theroux), who also happens to be Lloyd's dad. Pitting father against son, the epic showdown tests these fierce but undisciplined modern-day ninjas as they learn to check their egos and pull together to unleash the inner power of Spinjitzu. THE GOOD - A ton of heart at the center of its story revolving around a son and his estranged father. Justin Theroux's voiceover performance as the evil Lord Garmadon. THE BAD - The film's humor is catered more towards children than adults. The magic that was once introduced years ago with the first Lego movie is starting to wear off. ​Warner Bros. needs to be very careful with The Lego franchise at this point. When "The Lego Movie" (2014) came out a few years ago, it felt original, unique and it charmed the hell out of us. Fast forward a few years later and now we have received two new Lego movies within the same year. First was "The Lego Batman Movie" which, while not as good as the first Lego movie, was still an exciting and fun romp (That surprisingly worked incredibly well as an actual Batman film in its own right). Now, with "The Lego Ninjago Movie," the cracks are beginning to show in the formula for how these movies are presented, animated and feel. The magic is starting to wear off but just barely. 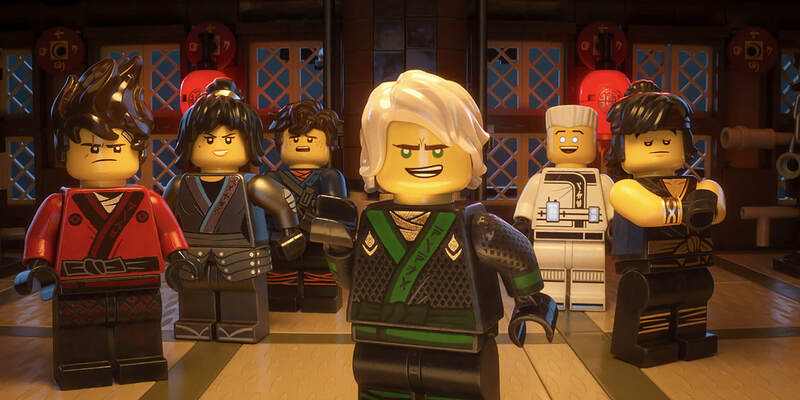 Taking place on an Asian island, the city of Ninjago shuns Lloyd Garmadon (Dave Franco) for being the son of the evil warlord known as Lord Garmadon (Justin Theroux) who is always trying to take over the island. Lord Garmadon is continuously thwarted by a team of teenage ninjas (Think the Power Rangers) which secretly consists of his son Lloyd, Kai (Michael Pena), Jay (Kumail Nanjiani), Nya (Abbi Jacobson), Zane (Zach Woods) and Cole (Fred Armisen). However, Lloyd can ever find it within himself to truly defeat his father once and for all. When an "ultimate weapon" is unleashed onto the island of Ninjago, the group of teenagers must make an uneasy alliance with Lord Garmadon to save the island leading to Lloyd having to confront his estranged father. The number one thing that hurts "The Lego Ninjago Movie" more than the other two films is that it is simply not as funny as the first two installments. Sure, it has its moments. However, the quickly paced jokes have lost of their wit here resulting in humor that feels targeted solely at kids instead of adults. Maybe it is the lack of pop culture references. Maybe it's the lack of a strong voice cast who can carry the film through its spotty screenplay. Whatever the case may be, "The Lego Ninjago Movie" does not come close to carrying the same level of giddy excitement one felt while watching the first two. What "The Lego Ninjago Movie" does get right, however, is its emotional story between an abandoned son and his troubled self-centered father. This is where the heart of the film lies and it is its greatest asset. The loneliness, the rage, the confusion and the forgiveness found within this relationship helps to keep the film afloat. And while Dave Franco does a commendable job leading the film, the true voiceover standout is Justin Theroux (Star of HBO's "The Leftovers"). His quick wit, manic presentation and the wide range of both high and low emotional tones, helps to give his character extraordinary life. His Lord Garmadon is a memorable character that brings the film to life every time he is on screen. Other notable aspects pertaining to "The Lego Ninjago Movie" is its still breathtaking animation, one that still feels new and unique despite us having witnessed it in three films already. Where, "The Lego Batman Movie" did not mix in live action elements as "The Lego Movie" did, "The Lego Ninjago Movie" brings back the live action elements to greater effect. This includes a pair of bookend scenes involving the legendary Jackie Chan (Who also voices Master Wu, the old leader of the group, Lord Garmadon's brother and Lloyd's uncle) and a live photographed cat, that is enlarged to hilarious effect and brings destruction to the city of Ninjago as "The Ultimate Weapon." "The Lego Ninjago Movie" is not a perfect animated film and certainly has its flaws. What once felt fresh and distinct, is now starting to feel old, tired and repetitious. There's no doubt that Warner Bros. will continue to put these Lego films out and keep the formula exactly as it is. My hope is that they will be able to find new and interesting ways to tell their stories through this animation style because as evidenced by "The Lego Ninjago Movie," when even one aspect of their formula fails to hit its mark, the entire film suffers.